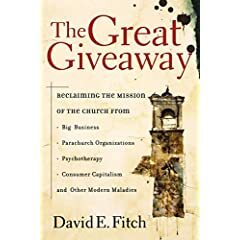 The second of a three-part review (Part 1, Part 3 ) of David E. Fitch's The Great Giveaway: Reclaiming the Mission of the Church from Big Business, Parachurch Organizations, Psychotherapy, and Consumer Capitalism. In this chapter, Fitch laments the moral failures of today's pastors, claiming that much of the problem is due to Evagelicalism's fascination with pastors as CEOs rather than faithful shepherds. The "Pastor as CEO" model isolates the pastor from the rest of the fellowship, making him an outsider who must never falter. That perfectionistic ideal helps foster the very moral failures it seeks to prevent. It creates ministry class distinctions and reinforces the negative industrialized ideals of modernism, warping leadership into nothing more than science, efficiency, and "please the shareholder" thinking. Church Growth principles are largely, though not entirely, to blame for this transformation of pastoral leadership. The penetration of modern business practices into church leadership turns Christianity into a set of techniques. Discipleship and leadership become nothing more than behavioral responses to proper programming rather than a living, vital faith. The Church cannot be the Body of Christ if it is founded on business ideals coated with Scripture to make them palatable. Scripture is our only source for leadership and discipleship, not TQM, ISO 9001, or whatever Jack Welch blabs about in his book Winning. By creating CEO pastors, we ensure the false idea that only one person is in charge. Only one person has the correct interpretation of Scripture. Only one person is equipped to minister. This fosters a passive congregation that acts as an audience, giving away its responsibility to be a community of faith. All church life exists in community, and the pastor must be treated as a co-equal in that community. He must be allowed to stumble and to also seek, just as the individuals in the community do. Ministry is a community activity, not just something done by pastors. Interpretation of Scripture belongs to the community, too, not the pastor alone. The model for real pastoral care is found in servanthood, not CEO-dom. Fitch longs for greater emphasis put on ordination as a rite into true service. He believes that too much had been made of pastors knowing facts from the Bible, and on seminary graduation, than on an ordination process with effective oversight. We make pastoring too much a science and a professional credential than a practice of humble service to others. Fitch also wishes to see seminary training take on more of a monastic living style than being simply a time to perfect doctrine. Seminarians would live in groups, farm, cook meals, and eat together. In addition, they'd be expected to take part in group prayer times, participate in confessional and accountability groups, take care of children, serve the poor, and live out their beliefs in genuine, humble service. Pastors should also be a part of confessional groups after seminary. Fitch also recommends that pastors be bivocational to better understand the daily lives of their congregants. Any pressure this puts on a lone pastor would be dispersed by eliminating the concept of a church served by only one pastor. Instead, churches would be better served by teams of leadership and not a pastor alone. I thought this chapter was brilliant. While Fitch may have attributed too much of today's pastoral problems to business practices, his practical solutions are right on, more than covering his narrow focus. We must do something to cure our seminaries of their one-sided leanings toward the purely rational and didactic. Too much of what today's seminarians learn is theoretical and not enough practical. The return to a more monastic type of seminary would better turn out servants and not CEOs. Giving church control to congregations and not one or two individuals is also critical. While many churches believe they do this with their pastoral staffs, too often it's more like the king and his court than a parliament of leadership equals. As for the idea of bivocational pastors, I know that too many pastors have been so insulated in the pastorate they lose all touch with what working people face in the cut-throat business world we have today. Being bivocational also reinforces the idea of servanthood, since few vocations will find a pastor dwelling in the corporate penthouse. Being one of the tiny cogs in the corporate machine would go a long way to waking up Church leaders in America to the moral disaster we've created with our modern business practices. Are we worshiping God or creating personalized experiences? Fitch claims that Evangelicalism has veered into selfishness by overemphasizing the role of the individual. Modernism exalted the individual, but worship must be a communal activity, "Us," not "Me." Modernism's conceit here is that one person can possess all the truth. Fitch says that the truth of the Gospel is meant for communities, and it is within community that heresy is fought and the truths of God best revealed to each person. In this chapter, Fitch delves deeply into postmodernism, showing that, if left to its own, the modernistic individualism that so permeates our churches today ensures everyone hears a different Gospel. He takes on the subjective way in which we worship and communicate the Gospel, claiming that we're only fragmenting the truth of God in a consumeristic fashion. He writes that we need to recover narrative preaching and an understanding of the Gospel as a redemptive story that includes you and me. Framing what Christ did within history ties us into the traditional church of our ancestors. His remedies for glitzy, experience-driven churches are old school. First, he longs for a return to liturgy (though he allows for a modernization) because it grounds the church meeting in shared worship and meaning. Rituals and rites of passage have their place in the Church, but Protestants gave them away in their mad rush to distance themselves from Roman Catholicism. Fitch also argues that Protestants mistakenly gave away symbols, art, music, and all things beautiful in their worship, sterilizing it from the rest of culture. He also desires a return to a Church calendar, at least in part, where churches better follow Advent, Pentecost, and some other regular seasons that have been abandoned in most Evangelical churches. Along those same lines, he believes Evangelicals have cheapened the meaning of the communion meal, relegating it to a few words spoken over grape juice and crackers rather than the meaningful meal it once was. Anyone familiar with "Ancient/Future" discussions within the Emerging Church will recognize much of Fitch's commentary. He decries the shallowness of Evangelicalism created by false pietism and rugged individualism. In that, he's largely right. Evangelicals have run screaming from anything that smacks of the ritualistic group-think of Roman Catholicism, save for some Evangelical Lutheran, Anglican, and Episcopal churches that still practice many of the unifying rites and rituals he recommends. Having grown up in an Evangelical Lutheran congregation, I can honestly say that I do miss seasons like Advent and Pentecost. I do miss some, though not all, of the ritual practices. I agree wholeheartedly with Fitch that our church services today have been stripped of far too many elements that help root us in Christ and in community. The Old Testament practices of worship resemble the old school style more than what most Evangelical churches practice today. God, obviously, is not against ritual. Despite my agreement with some of Fitch's ideas here, this chapter (and the one following) were by far the most turgid and philosophical. While he may be a good church practice analyst, Fitch struggles in places in The Great Giveaway to get his points across in a cogent and accessible manner. The other lack comes from Fitch not addressing the flaws in his solutions. Many Evangelicals fled the kind of church Fitch advocates. But Fitch doesn't deal with the lacks in liturgical churches heavy on "symbolism and meaning" that led to their diminishment today. While any thoughtful reader will be able to fill in the blanks here, some acknowledgment by the author would better help readers develop a true Evangelical practice that avoids what killed liberal Protestant churches that still practice liturgy. Expository preaching fails because meaning is not universal. What the pastor preaches and the congregant understands are not necessarily the same thing. This only sows confusion and discord. Cultural and societal standards also create different meanings within a Scriptural passage. The Asian, African, and American will not interpret the same passage the same way because their cultures are different. Fitch asserts that modern science governs the way the Bible is interpreted today. But processing a passage through a specific set of exegetical lenses cannot guarantee the correct interpretation of meaning. For this reason, Fitch decries the Reformation's idea that each person can correctly interpret Scripture. With so many interpretations of a single passage abounding today, how can anyone, especially a preacher, be more than just a picker and chooser of this interpretation or that? Seeker-sensitive churches accuse Bible churches of keeping the Bible shrouded so that those outside Christ cannot understand its message. Bible churches accuse seeker-sensitive churches of watering down the Gospel. Fitch claims both are missing the point. The preaching of the Word must be seen in a communal context in which its meaning is held by the community that submits to it. Because meaning is held by a community, it is self-correcting of wayward individuals. No one person has "cornered the market" on a passage's meaning. The community, not the individual, does the interpreting. Fitch advises that we recapture the narrative value of Scripture that draws the individual into a shared understanding. While expository preaching hands the listener a to-do list, narrative preaching puts us listeners in the story of God's redemptive acts so that we can better understand who God is and how He can use us in His story. This type of preaching resists forcing Scripture to be interpreted by culture rather than the other way around. Likewise, narrative preaching allows prescriptions (to-dos) to naturally follow description, the way the Bible lays out truth. In the practical vein, Fitch asks that we return to lectionary reading that follows the church seasons. We should also return the speaking of the Word in our meetings to the congregation, rather than simply the clergy. Call and response uses of the Scriptures help the people absorb that they are responsible for what they hear. The application points of the typical expository message must return to a more holistic design that asks something of the gathered hearers immediately after the message. Fitch also calls for dialogue between the preacher and congregation after a message to better promote understanding, retention, and action. All interpretation must be tested by the congregation as a whole and not one individual. Ah, Jacques Derrida! He raises his ugly, meaningless head again. This chapter of The Great Giveaway is, by far, the most labored and least successful in the book. Problems abound on nearly every page. Fitch goes too emergent here, too conceptual, too philosophical, too buzzword, and ultimately derails. Words have meaning. That meaning may vary from culture to culture, but where Fitch sees this as a lack in expository preaching, I see it as a strength. The African or Asian preacher has something to teach me about a passage that I may not have heard through my American cultural lens. Whereas Fitch sees that as a testament to the weakness of exposition, I see it as a strength. Fitch commits a grave error here by saying the whole of Christendom cannot hold multiple interpretations of the same passage. I see no problem with that, even if they appear to conflict. If anything, denominations that hold to one approved interpretation are much more likely to miss the nuances that make the Bible profound. The Bible is rich. It has rich meaning. Yes, no one person has a handle on all its truth, but together we get a better vision of its depth. Fitch also holds the local church in too high esteem for its ability to rightly divide Scriptures. What's to say the church across the street doesn't have a different interpretation than what my church community decided. In truth, that's how it is now from church to church, so how is Fitch's recommendation better than what is already going on? While it may be a logical fallacy to equate the two, the poor understanding most Christians have of the Bible today parallels the demise of expository preaching in many Evangelical churches. Somewhere in those two facts lurks a correlation. Nor is narrative preaching a surefire hit. I've been in churches that preach like Fitch recommends and Biblical knowledge can be just as sorely lacking as anywhere else. Nor is this a prescription against heresy. Again, witness liberal liturgical churches and their horrendous ability to self-correct using the type of preaching Fitch advocates. This chapter of the book doesn't work—period. I didn't follow most of Fitch's points because he didn't make them as clearly in this chapter as in others. Either the argument is too subtle for his writing style, or else Fitch doesn't have enough ammo to fight the fight he picked. Either way, too much of this chapter reads like mumbo-jumbo. Considering I'm already familiar with complaints by the Emrging Church against expository preaching, that's a sad indictment of this chapter. Worse yet, some of Fitch's recommendations for practice (while nice to have in a church) aren't prescriptive for the ills Fitch himself exposes earlier in the chapter. While I agree that expository preaching as it's done today is not as effective as it could be, I don't have good answers as to how to better it. Nor does David Fitch. So we end this second part of the review on a down note. But stay tuned, because Part 3 of this review will cover what I believe to be the best portion of The Great Giveaway. Someone said -D. A. Carson?-that “a text without a context is a pretext for prooftext”. That’s why I like expository preaching because you really get to see how the pastor handles the difficult texts in a book and we get to see the connection between verses in context. Same thing applies for personal bible studies and so. Topical bible studies are hard to put up when one has not been acquainted with the topic one wants to communicate: Some verses are left out, time is up and etc. Your text quote sounds vaguely like something Leonard Ravenhill would say. Where to begin? In my church one of the issues that is most painfully evident is the perception that the Elders are members of a board that passes decisions based on what the Pastor (the chairman) determines is the best way to go. While the pastor will be the first to protest, it is the perception in congregation that matters. The elders do communion, sometimes lead sunday school classes, but mostly are seen as “lesser vessels” than the pastor. From a spiritual standpoint, however, and I believe the bible bears this out, the elders and the pastor are on an equal footing in terms of spiritual maturity, roles in the body, and responsibilities to the body. The Pastor is merely the one chosen to be the “shepherd,” or the one with final responsibility for the well-being of his particular body. The elders are too often willing to abrogate their responsibilities not only to the body but to one another. The result is a very lonely position of ‘Pastor’ that is unsupported by fellow Elders. Worship as an experience (rather than the state of being it should be) is one of the defining issues facing today’s church. One of the more obvious symptons of this basic misunderstanding of worship is the argument over hymns vs. praise songs, or traditional vs. contemporary. Honest to pete, if the song is in praise and worship of our Father, who cares what musical style it’s in? But because we seek to “feel good” rather than worship God, suddenly style matters, and we all become little Michals, chastising David for acting the fool. We must be careful lest we suffer her fate. Preaching is always the elbow in the ribs joke of “church.” Dennis the Menace usually threw one in about his father’s reaction to the preaching. Andy Griffith had a joke tossed in every once in a while about preaching, and even the bible threw one in about the long windedness of Paul knocking ’em dead. First off, Church is for believers. Trying to bring people to Christ from the pulpit does not strengthen the body, it merely creates a milk-fed 800 pound baby. Preaching is only one of the many methods listed in the bible of teaching and exhorting the body, but we have made it the be-all and end-all centerpiece of the Christian experience. Everything on Sunday leads up to the sermon, and the rest of the week is to be somehow lived off of the sermon. The pastor is often pictured as being paid to deliver that message, and so he had better be slaving away at it every day but Monday. Expository or not, it’s the wrong emphasis. Teaching should be an unending theme of our being in the body, with the Sunday sermon merely icing on the cake, and if it’s uttered in the Spirit, becomes the bow that ties the week up, and sends us galloping into the next with fervour and joy. I am so blessed to be in a church that has no jostling for position among the elders and pastor. The pastor used to be one of the elders, and all four of them have been in that church for many years together. The three elders speak almost every service and basically handle everything on a typical Sunday but the preaching. We have a pastor emeritus who preaches sometimes when the pastor is away. We also have gifted lay people who preach from time to time. I’ve never once thought there were any egos involved in any of it. That’s a real blessing. I don’t know if it’s ego so much as spiritual immaturity. Fitch’s assertion of congregations choosing bible knowledge over spiritual maturity in pastors has a flip side in the choosing of Elders for their people or coordination skills over their biblical knowledge or spiritual maturity. The result is an imbalance within the leadership of the body.